JaVale McGee and Stephen Curry were the catalysts for the Warriors in Game 2. If the series opener of the NBA Finals showed how much impact the best player in the world can have when he’s at his peak, Game 2 exhibited just how demoralising the best team in the world can feel when they’re clicking. 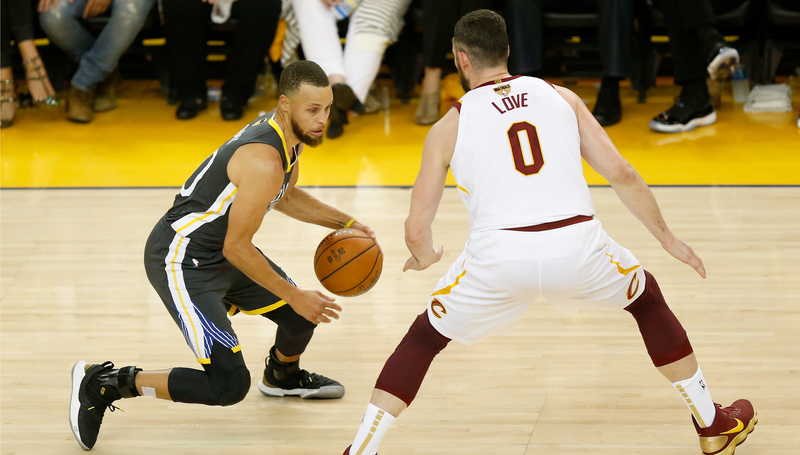 From start to finish on Sunday, the Golden State Warriors were on top of their game as they comfortably handled the Cleveland Cavaliers 122-103. Golden State didn’t need Cleveland to shoot themselves in the foot or have to pull it out in overtime this night as they took the initiative by playing their brand of basketball and playing it well. The Warriors were hyper-efficient scoring the ball on one end of the floor, while on the other they forced players not named LeBron James to beat them, which the Cavaliers couldn’t do for the most part. Of all people, JaVale McGee set the tone after Golden State coach Steve Kerr inserted him into the starting lineup over Kevon Looney. The change didn’t improve the floor spacing from a conventional sense, but McGee’s ability as a roll man burned Cleveland over and over again as they struggled to stop his dives to the rim after he set a screen for the ball-handler. McGee had the first two buckets of the game off dunks and finished a perfect 6-of-6 for 12 points. His defence was also significant as his length provided more rim protection and made life a little bit harder for James on drives. The Warriors’ defence as a whole was much better than in Game 1, when James ran roughshod on them for 51 points and torched in isolations. This time around, Golden State weren’t shy about doubling and bringing their help defenders a step or two closer to the paint to deter James’ drives. For almost every other team, that strategy would potentially backfire, but because the Warriors have so much collective length, they can bother James while also rotating quick enough to run the Cavaliers off the 3-point line or contest their looks from deep. Offensively, Golden State couldn’t have shot better as they hit 57.3 per cent from the field and 15-of-36 from beyond the arc. 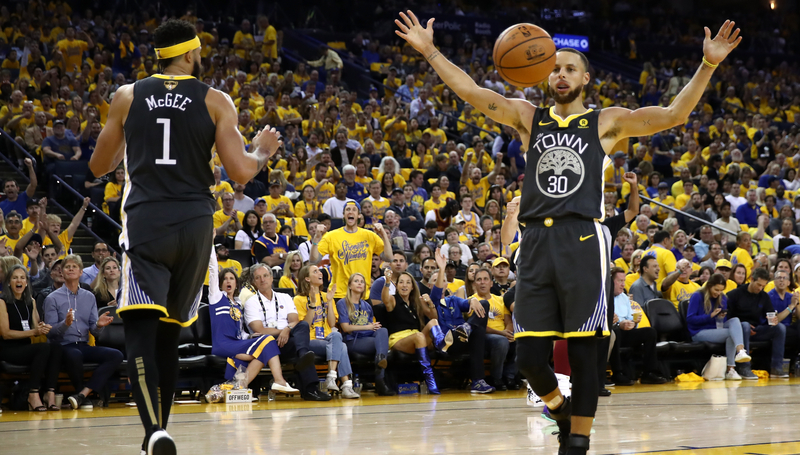 Stephen Curry was unconscious towards the end and finished with an NBA Finals record nine 3-pointers, but even outside of him, Kevin Durant, Klay Thompson, Shaun Livingston and McGee were a combined 29-of-38. Such is life against the Warriors that when they’re on, they’re really on, and that can leave opponents feeling defeated. Sometimes, it doesn’t matter how well you play on defence because one of Golden State’s deadly shooters can make it a moot point with a difficult make, like Curry did with his ridiculous 28-foot fadeaway over Kevin Love in the fourth quarter. Cleveland can take some solace in the fact they were within reach for most of the game despite taking the Warriors’ best shot on the chin. But unless James’ supporting cast plays better, it won’t matter. With the way Golden State’s defence was geared to slow down James in Game 2, that put even more pressure on his teammates to step up as many more possessions ended with them shooting. George Hill came out with an attacking mindset and had 12 points in the first half, but was just 1-of-4 after the intermission as his aggressiveness seemed to fizzle out. Love, meanwhile, topped 20 points again but was 7-of-18 from the field as he left makeable shots on the court for the second straight game. After catching so much heat for costing the Cavaliers in the series opener, J.R. Smith carried over his struggles into Game 2 as he had five points on 2-of-9 shooting. Through two games, Cleveland are 8-of-32 on 3-pointers off James’ passes, including 5-of-16 on uncontested looks, according to ESPN Stats & Information. Role players typically perform better at home in the playoffs, so the Cavaliers will hope their shooting woes turn around when the series shifts to Quicken Loans Arena for Game 3 and 4. Otherwise, there won’t be any need for Cleveland to return to the Bay Area.